CORPUS CHRISTI — Danielle Hale had been working 18-hour shifts for a few days already when her son Conner, then 7, called. It was August 2017 and she was stationed in a conference room at the Port of Corpus Christi, where she’s the manager of safety and emergency planning. Days earlier, Hurricane Harvey made landfall on Aug. 25, shaking the coastal communities of Rockport and Port Aransas before traveling further up the Gulf Coast to stay put over Houston. Hale’s son — along with her husband and two other children — evacuated to her in-laws’ home near Lake Corpus Christi. She stayed behind to run the port’s emergency operations center. "Mommy, I don’t want to go home," Conner told her over the phone. "There are no leaves on the trees." The Category 4 hurricane had blown through Rockport — where the Hales live — with winds on the verge of 130 miles per hour. Conner had overheard the grown-ups talking about the destruction left in Harvey’s wake. The eye of the storm passed right over Rockport, destroying countless homes and businesses. The Hales' home was among those lost. 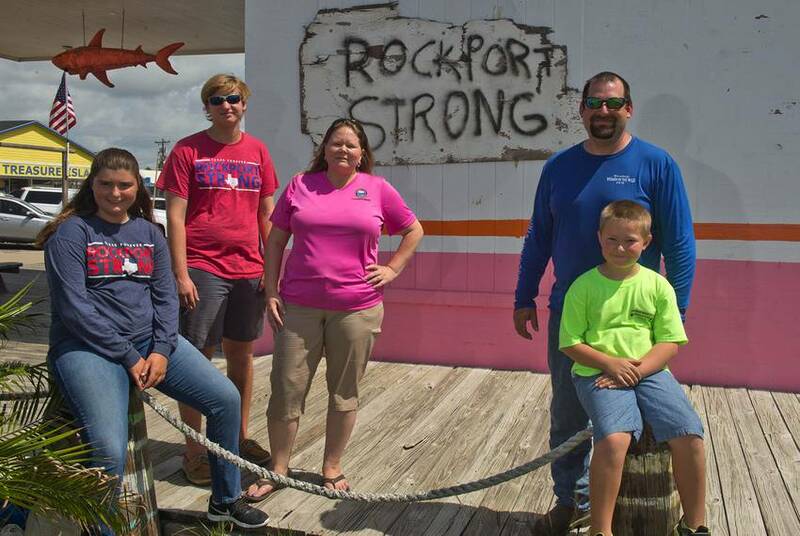 A year later, Hale and her family continue to help rebuild Rockport, where residents are still repairing damaged homes and City Hall remains closed. In nearby Corpus Christi, the port continues to fine-tune its emergency preparedness plans. Earlier this year, Hale was named a StormReady Community Hero by the National Weather Service for her work at the port and also for her contributions to the community in the months after Harvey. She is the seventh to receive the award since it was created in 2002, and the first for actions related to a hurricane. As the sun came up the morning after the storm made landfall, Hale’s husband, Micah, got word that everything in their coastal neighborhood was destroyed. 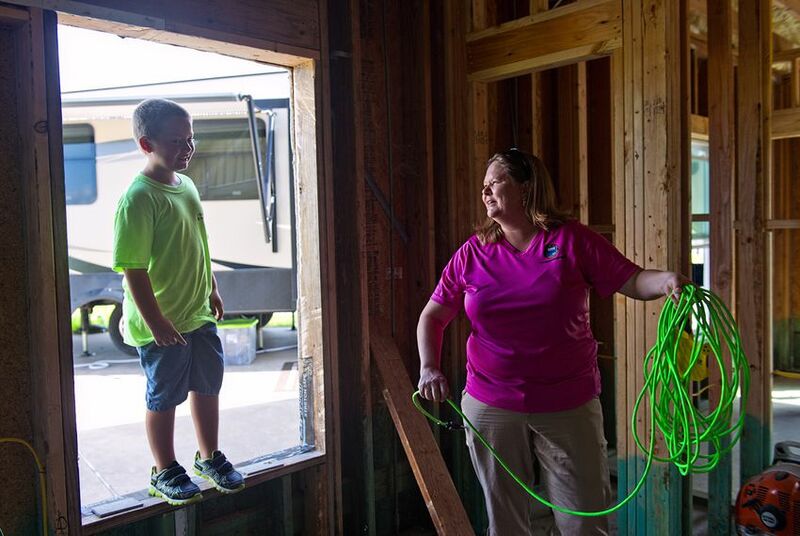 With the help of family and friends, the Hales have been able to transition from being displaced to living in an RV to finally moving into a new home. At the same time, the Port of Corpus Christi has continued to hone its emergency preparedness plans under Hale’s leadership, training more staff to fill a variety of emergency response roles, and ensuring plans for other types of disasters are thoroughly vetted. “As we plan for the future, we’re highly cognizant of the fact that during hurricane season, we have to be prepared,” Collin said. As manager of the emergency operations center, Hale ensures that the port's incident management team stays on schedule and follows emergency procedures, while coordinating with different departments at the port. After Harvey, she stayed at the port until Aug. 31 before regrouping with her family. Through it all, coworkers at the port kept asking her, "How are you here? Go home and be with your family." But Hale chose to stay. It was her job, but it was also an outlet to keep her mind busy. Hale “accidentally” found a career in emergency response when she moved back to Rockport from Texas A&M University in 2001. After watching her mother work as an EMT, and surviving the Aggie bonfire collapse of 1999, she felt instilled with a desire to help. So, she took a job as a 911 dispatcher. From there, she expanded her skills to work as an EMT, volunteer firefighter and paramedic. She started teaching courses at regional fire safety schools. Interested in how to make the emergency response system better, she made the jump from providing one-on-one treatment to emergency management. After about 15 years of working throughout the Coastal Bend, she started at the port in October 2016. The Port of Corpus Christi is a key shipping access point on the Gulf, handling commodities like petroleum and grain. It is the fourth largest port by tonnage in the country. In early August, just as Harvey was forming off the coast of Africa, the port was recognized as “StormReady,” as part of the National Weather Service’s community preparedness program. By then, Hale and her team were already keeping tabs on the storm’s movement. They activated the emergency operations center before Harvey made landfall. Hale had handled hurricane response before, managing emergency operations during Katrina and Ike. But Harvey was her first Category 4 storm. Harvey was also the first major storm for Hale’s team at the port. With no hurricanes hitting Corpus Christi since the 1970s, all they had to rely on was past planning and training. For days, Hale coordinated between different port departments and first responders. After six days, the port was able to re-open with no casualties or environmental incidents. As operations at the shipping hub returned to normal, it was time to assess the damage to the community. For Hale, that not only meant figuring things out for her family, but for friends in the area as well. She and her family organized meals on their property and connected people with clean clothes. She still organized the Aransas County 4-H Club’s annual fundraiser in the weeks after the storm, even though the club had lost most of its resources. Hale was surprised to see these details mentioned in the nomination for her StormReady Hero award. It shouldn’t be about her, she said. Rather, her award is a chance to remind people to gear up for hurricane season and reflect on the progress her community has made.